To take a screenshot, either hit the Print Screen button on your keyboard, or use the build-in Snipping Tool found in Windows 10. Taking a screenshot is can be useful under many different circumstances, however, few seem to have mastered this wonderful feature in their operating system. How to take a screenshot is actually done in similar ways in most operating systems. In Windows, you can either take advantage of the build-in tool for the job, or you can do it the old fashioned way – by hitting a shortcut key on your keyboard. Before you move on, let us first talk about a less known capability of modern applications. Usually, after having taken a screenshot, you would first paste it into a program such as Paint.NET, Gimp or Photoshop, only to save them to a file, and finally share the screenshot with a friend over instant messaging. Now, this is no longer necessary, since you can simply paste the screenshot directly into the chat window, and whatever app you are using should automatically handle it for you – this also works on Facebook Messenger. 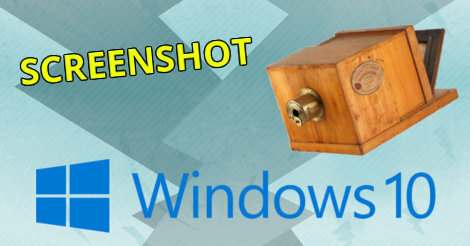 In Windows 10, taking a screenshot can be done in a couple of ways. The traditional method is to simply hit Print Screen (Prt Sc or PrtScn) on the keyboard. However, if you want to select an area of the screen, you should instead use the build-in screenshot tool, also known as the snipping tool. To take a new screenshot, click on the "New" button, and simply choose the area of the screen you want to save. The screenshot, almost regardless of how you take it, will be stored in the clipboard for later use. You can either paste it directly into programs or chat windows, or you can paste it into a graphical editor where you can edit the shot before saving. To great annoyance for the users, some laptop manufactures like to mess with default shortcut keys, so when hitting Print Screen nothing happens – or even worse – something else happens. Hopefully this tutorial will teach manufactures not to mess with default shortcut keys in Windows. Also this: If it ain't broke, don't fix it. If none of the above worked for you, try reading the manual that came with your device (apparently you need to read it). Things that are truly annoying in Windows 10.